The goal of this mural was to relate to the local South Park residents by incorporating special nuances that they would notice and appreciate. From the historic clock face on the opposite street corner to the tree at the parking lot entrance, from the original 1900’s trolley that ran down the street to the flight of the hummingbirds that are native through this region, we wanted to reference the special features of this beloved neighborhood. Our hope is that residents and shoppers alike will love and appreciate the mural as much as we relished creating it. 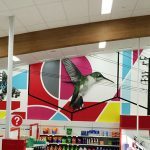 Thanks to the @target team for the opportunity to create. View “LIVE” progressive photos through the “Kreashun Project” in “Portfolio”.